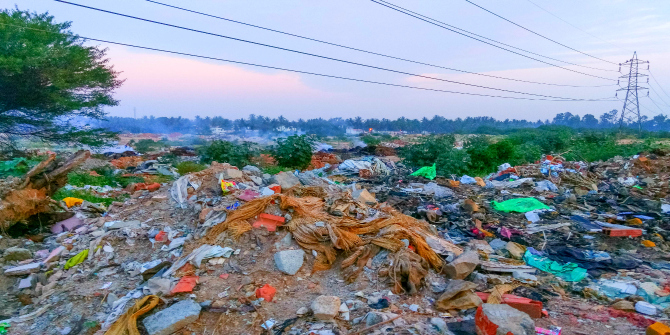 In Waste of a Nation: Garbage and Growth in India, authors Assa Doron and Robin Jeffrey offer a compendious account of waste in India, exploring its implication in questions of economic growth, public health and natural resources. The book offers an impressively expansive mosaic, finds Dagna Rams, that will be of particular interest to those seeking a panoramic understanding of this national challenge. 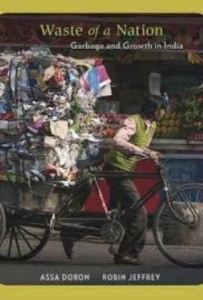 Waste of a Nation: Garbage and Growth in India. Assa Doron and Robin Jeffrey. Harvard University Press. 2018. The title of Assa Doron and Robin Jeffrey’s new book about waste in India is a word play on the famous ‘Wealth of Nations’ by Adam Smith – a shrewd way to remind readers that waste is ultimately a form of capital (‘one person’s waste is another’s treasure’), and that the wealthier the nation the more waste per capita it generates (shout out to Luxembourgers). Waste in India is no different in that respect. Rather, the uniqueness of the context, according to the authors, stems from the high population density that makes waste management a mind-boggling task and from a system of beliefs especially around caste that ‘haunt India’s efforts to cope effectively with the waste of a vast, urbanizing population’ (2). Doron and Jeffrey approach waste as a national question closely entwined with that of economic growth (how to balance middle-class spending power with environmental needs); public health (how not to die from polluted water or smog); and natural resources (how to keep the waters clean when 60 per cent of India’s sewage ends up in water channels and on open ground untreated). Their discussion of the subject is compendious: I don’t think there is a waste stream or waste-related issue that the authors haven’t covered in brushstrokes at least. One of the first questions that Waste of a Nation asks is: ‘why is India so filthy?’. Interestingly, to answer it, Doron and Jeffrey invoke the Great Stink of London in 1858 when the River Thames was an open sewer bulging with diseases (even Queen Victoria was not spared from contracting typhoid at sixteen), in order to state that Britain was already helpless in governing its own waste, let alone that of its imperial subjects. When Britain finally woke up to its responsibilities in the late nineteenth century, around the time of India’s bubonic plague, its response was excessive quarantines and occasional home demolitions that met with little support and gave public health a troubled legacy. Mahatma Gandhi’s Independence struggle promoted frugality and village life centred around agriculture and crafts. Although these ideologies haven’t prevented the sprawling urbanisation of today and its pressures on waste management, statistics affirm that Indians remain prudent consumers: an average American creates 150 times more waste than an average Indian (43). India’s current Prime Minister Narendra Modi, who was interviewed for the book, casts himself as the passionate defender of public order. His campaign ‘Sachh Bharat’ to clean streets and eliminate public defecation under slogans such as ‘Toilets first, temples second’ aims to ensure that by the time of Gandhi’s 150th birthday anniversary in 2019, there will 90 million toilets around the country. All this takes place against the backdrop of India’s caste system that associates waste with people who handle it, adding the worry of ritual notions of pollution to the list of waste’s risks. Answering how these complicated historical legacies and social realities play out on all levels of India’s waste management and development is the ambitious task that Doron and Jeffrey take upon themselves. One by one, the chapters compile an impressively expansive mosaic. We learn about sewage. In India, the problem is that there are not enough flushing toilets connected to well-managed sewers; instead, manual scavengers who empty latrines and clean septic tanks are still common despite being illegal. We learn about how high rates of open defecation lead to increased levels of stunting among children. We learn about the technologies that are needed to make it all work, but in as far as ‘technology is simple (…) governing society is difficult’ (145). We learn about the underresourced local governments that lack the expertise or legislative muscle to do anything about waste in their constituencies. There is no research instrument that the authors shun: the reader finds many impressive statistics that only occasionally raise the question of ‘how the heck was anyone able to calculate that?’ (for example, the fact that India’s annual waste accumulation is 65 million metric tons, which is equal to more than 38 million Toyota Corollas piled up, which in turn would require 122 square miles to park (66), and that India’s waste is 5 per cent rags (101)). There are also references to multiple sources across disciplinary divides, from Florence Nightingale’s diaries to World Bank reports and engineering textbooks. If all this is not kaleidoscopic enough, the reader also tours with the authors an impressive range of places to meet their actors and see their activities: businessmen who recycle hair which they gather off the sidewalks; a town that specialises in recycling ships from around the world; a range of NGOs dotted around the country and their more or less impressive workers. Occasionally, the quality of the data tries to catch up with the quantity. Not all the sites that the authors visit are willing to give them the information they need. And the collage-like narrative, while appealing to the scattered brains of the Internet generation, occasionally falls into a non-sequitur (for example, between pages 45-55, the authors discuss the city of Chandigrah and its Le Corbusier plan, waste statistics in China, the history of India’s population management policies, Gandhi’s romanticisation of village life and the complexity of a toothpaste tube as a recycling material). But such lapses are not all negative: they are the perfect inspiration for an anthropologist to go more in-depth through the door that Doron and Jeffrey have left slightly open or for a patient academic to connect the dots. The authors’ consistency in positioning India’s problems on the wider historical and geographic scale (comparisons to other countries are frequent) means that the book is as much about waste in the twenty-first century as it is about India. Waste of a Nation should be especially useful to those who search for a panoramic understanding of this new national challenge, practitioners who want to know where their expert acumen is needed and those who are struggling to find a research topic of their own but intuitively feel that waste is what they care about. I would only caution readers not to take the authors’ enchantment with technological progress at face value (sanitary landfills have their problems) or their occasionally voiced, heartfelt but unproven assumptions that poorer waste workers are somehow logically apolitical: ‘people who lack secure shelter and workplaces regard public areas as spaces in which they have little investment […] For them, the Clean India pledge, let alone its practical application, is meaningless…’ (257). I don’t think there is anything in the text to suggest that such a vast social group is so uniformly unconcerned. Dagna Rams (@dagnna) is a doctoral student at the University of Lausanne. Her research is on politics and informal economies of electronic waste and scrap in Ghana.